Scots pine on the ridge above the fishing pond. 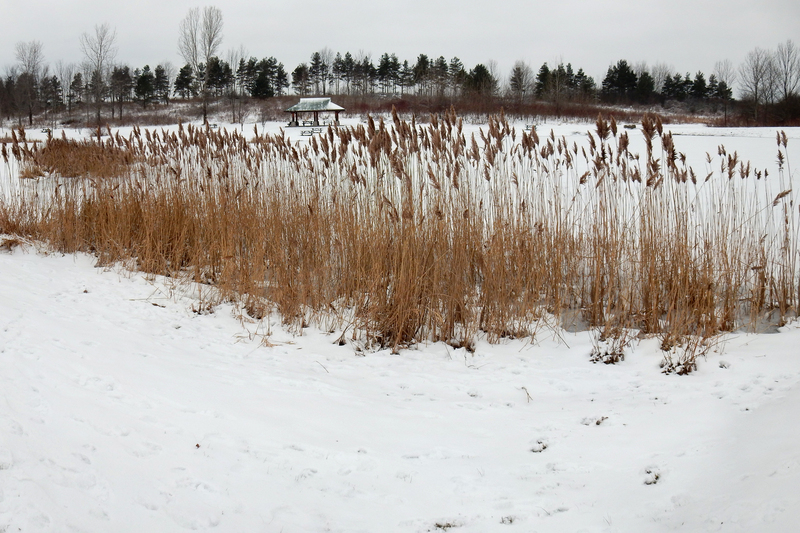 Phragmites autralis on the edge of the pond in the foreground. The view is toward the West. Dec. 2014. Scots pine, or Scotch pine (Pinus sylvestris) is the most widely distributed pine in the world and is adaptable to a wide range of climates. Its native range extends from the arctic circle in Scandanavia, to the Mediterranean, and from the Western Europe to Siberia. Scots pines have a prominent location on the Federal Farm, having been planted along the ridge above the fishing pond, and clearly visible from Old Seneca Turnpike. An attempt to count the growth rings on one of the dead ones, whose trunk had snapped near eye-level, revealed that it was probably about three decades old when it died. So if we assume that it stopped growing about five years ago (having probably fallen a year or two ago), that leads to a planting date of around 1980. The satellite and aerial images found thus far leave a thirty year gap between 1966, when the land was still clear for USDA soil testing work, and about 1996, when a USGS satellite image showed that there were evergreens growing in that location. This could corroborate the 1980 date. 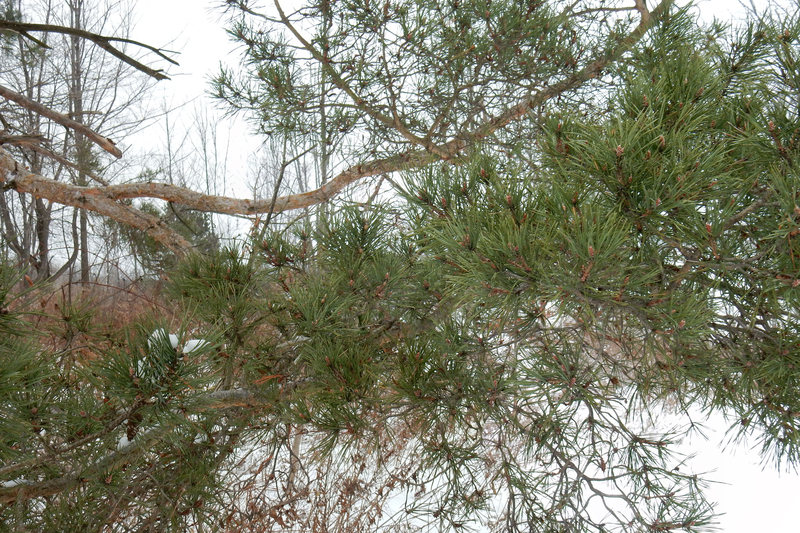 Branch of one of the Scots pines on the ridge above the fishing pond, December 2014. These trees, along with our other non-native conifer, Norway spruce, have been commonly used for reforestation purposes. However, because of its more aggressive growth rate, Scots pine has caused problems when planted with native conifers. It also tends to produced mat of seedlings that displace native plants in some environments. It has been found to be especially invasive in parts of Ontario. And as with most non-native plants, it cannot provide support for the native wildlife, which has evolved to live on native plants only. Scots pine does seem to be trying to naturalize on the Federal Farm to some extent. The photograph below shows that a number of young Scots pines have sprung up to the west of the main plantation. Most of these are coming up in old fields adjacent to the parent trees. Very few seem to survive under large parent trees themselves. This may be partly due to the fact that until the last few years they would have had a dense infestation of European buckthorn under the pines to contend with, and pretty much nothing but younger buckthorn and honeysuckle were surviving under them. 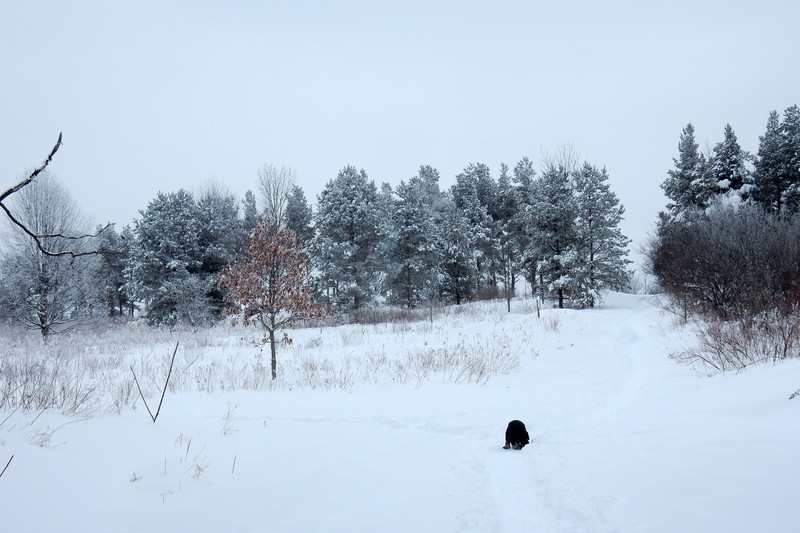 It’s also likely that the buckthorn was detrimental to the health of the Scots pines. Buckthorn becomes somewhat vine-like when it reaches up high into larger trees, and it had nearly reached the tops of the Scots pines in that manner. Buckthorn, along with its bush-honeysuckle partner, also seem to aid grape vines in their climb to the top of the pines. Scots pine on the ridge above the fishing pond. Feb. 2015. Since the buckthorn was removed, a good number of native tree seedlings have appeared under the Scots pines, most notably black cherry and sugar maple. But yearly buckthorn and honeysuckle resprout cutting, as well as some kind of deer protection, will be required for several more years to allow the natives trees to survive. It seems unlikely that the naturalizing Scots pines will become a problem here. Their lifespan seems to be quite short in this area, they are susceptible to some of the same insects and diseases as our native conifers (without the native resistance), and they don’t reproduce vegetatively. But it’s worth keeping track of them. Scots pine from observation deck looking North. Dec. 2014.